• Portable Vehicle OBD II Engine Fault Code Reader and Diagnostic Scanner..
• Must-have automotive digital tool for DIY and professional car engineers..
• Comes with 2.8-Inch TFT LCD display color screen..
• Easy to Use.. Fast reading and erasing of engine fault codes..
• Displays graphical/numeric live data stream and O2 sensor test..
• Reads vehicle information numbers (VIN, CIN, CVN)..
• Built-in code library for easy interpretations and on-screen definitions..
• Reveals causes of check engine light on dashboard..
• Able to reset and turn off fault codes..
• Compatible with most gasoline cars and vehicles..
• Supports all OBD2 protocols: ISO9141, KWP2000, J1850 PWM, J1850 VPW, CAN..
*GREEN color means your vehicle is in good condition. *YELLOW indicates some issues with your car waiting to be fixed. *RED means serious problem that must be fixed as soon as possible. 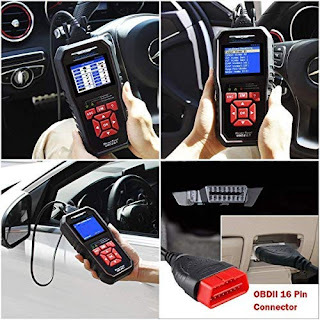 • Features build-in speaker for vehicle emission monitoring..
• Compact and durable anti-shock design that passed 15feet height drop-test..
• Comes with 5feet long diagnostic cable with 16-pin connector and a USB cord..
• Does not required any battery..
• Powered by the scanning interface in your vehicle..
• Supports following languages: English, French, Russian, German, Spanish, Portuguese, Italians, Dutch..